Sacroiliac pain sitting is one of the last common symptomatic expressions, since sitting tends to relieve most patients’ pain. However, the transitional positions between sitting and standing and between reclining and sitting are usually a severely painful ordeal for many SIJ patients. Sitting is an activity that is full of mythology when it comes to lower back pain. It is a completely innocent and universally-practiced anatomical posture that is in no way pathological to humans. However, sitting still might exacerbate some pain syndromes, including rare instances of sacroiliac symptoms. This dialog discusses the reasons why sitting might increase pain for some patients and some sacroiliac joint conditions. Seated pain might occur only when sitting for an extended time frame or might ensue almost immediately. Basically all sacroiliac joint pain syndromes have the potential to worsen when bearing weight or enduring escalated stress on the affected leg. This is why standing and climbing stairs are so difficult for patients with severe symptoms. Meanwhile, sitting distributes weight across the buttocks, posterior thighs and even down into the floor, via the feet. This position exponentially decreases the load on the SI joints and should improve, not exacerbate, symptoms. As mentioned above, it is common for patients to suffer pain when transitioning from a standing posture to a seated one. This is because the transition downwards can increase stress on the painful SI joint. It is also common for patients to have pain when transitioning from a reclining position to a seated position and from a seated position to a standing one, such as the process used to get out of bed every morning. 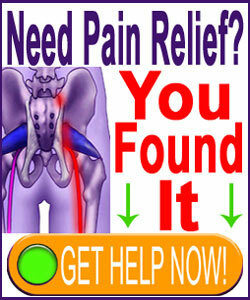 Seated pain group one consists of misdiagnosed patients who are suffering from specific health issues that might increase pain while seated, with whatever sacroiliac joint diagnosis they have received being nothing more than a scapegoat. Remember that misdiagnosis is a plague for patients and tends to affect lower back pain sufferers the most. Alternative possible explanations for pain might include lumbar spinal pathologies, hip issues, piriformis problems or other conditions that may respond negatively to sitting, particularly for extended lengths of time. Seated pain group 2 consists of people who are demonstrating psychogenic syndromes and are suffering due to the mindbody processes rather than any structural defect. If structural abnormality exists in the sacroiliac, it is coincidental and noncausative for pain. The patient usually does not know that sitting should provide relief, so their mind is free to sculpt the pain profile as it sees fit, creating often illogical expressions such as seated pain, despite a mistaken verdict of sacroiliac causation. For patients with seated pain, we highly encourage getting a second opinion on the diagnostic verdict. There is a very good chance that the conclusion might be wrong and you may be wasting your time on your current treatment path. 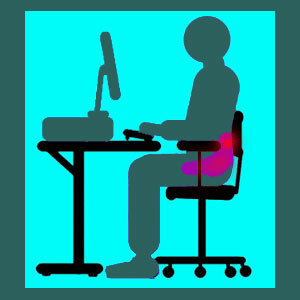 Remember that other structural issues can more logically create seated-related pain in the buttocks, hip or low back. Similarly, psychosomatic expressions can create symptoms anywhere under any circumstance and do not have to make sense from anatomical or ergonomic perspectives. If your SIJ diagnosis still stands after multiple diagnostic opinions, be sure to ask your doctor or physical therapist why pain persists during your time sitting, despite this fact seeming improbable. There might be a logical explanation, singling out your case as an exception tot the rule, but in many instances, most doctors will be hard-pressed to find any answer that truly makes objective sense.